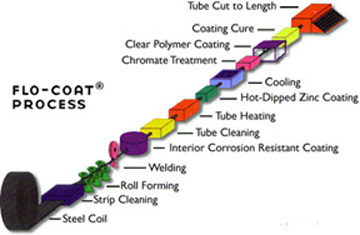 Allied’s continued dramatic growth is due in part to the patented Flo-Coat process that revolutionized the steel tube industry over 35 years ago. This process has been continuously improved upon, and is just as unique today. The triple coat corrosion protection provided by Allied's in-line manufacturing processes has never been equaled. This triple layer protection (zinc,conversion coating and clear organic topcoat) provides a smooth, shiny product appearance that is unmatched in terms of strength and durability.